I have reviewed the other books by Sandra Block that feature her protagonist, Zoe Goldman. I like to review books by local authors, especially ones who I have met. Sandra has been to the Lockport Library to speak about her books. It’s always fun to read books that are set locally and have familiar sights along the pages. 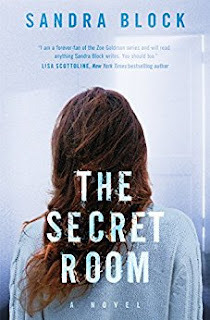 The Secret Room has less of those than in the first two books, but enough for Western New Yorkers to feel comfortable. Dr. Zoe Goldman is back again. As a fellow psychiatrist at a correctional facility, Zoe must try to break down why her patients act out in certain ways and ensure they don’t harm themselves while under care. When her patients start dying, one at a time, the administration takes a closer look at Zoe’s techniques and her capabilities. As her patients continue to drop, Zoe must clear the suspicions surrounding her as well as determine who is out to ruin her career and her life. While she works to discover who from her past could be out to get her, real life sends her a new set of hurdles to overcome. The combined struggles send her to the edge of her own sanity, and she begins to question her entire reality. Sandra Block writes this third novel of the Zoe Goldman series much as she wrote the first two. Zoe is still slightly manic. She still talks about her ADHD diagnosis, but it really plays such a minor part, we’re not faced with overkill like in the first novel. This thriller will keep you guessing all the way to the end. It will keep you guessing not only about the identity of the source of her troubles, but also about the state of her other relationships. One of the things I’ve truly loved about Block’s three novels is how invested the reader gets into the life of Zoe Goldman. Her character drips with life. All the uncertainties, fears, and hopes echo what we each experience at some points in our lives. She is a character that we truly empathize with. The reader will want to assure her that it will all work out in the end, not to worry so much, just as said reader worries about her. Block leaves enough of a tease at the end of the story to let her fans know that she is not finished with the Zoe Goldman story. We have learned enough through the backstory that the next pages for Zoe are going to be thrilling. Her life outside the mental health profession will probably play an even bigger role, juxtaposed against the anguish she helps her patients fight through. Sometimes, I come across an author who I cannot get enough of. Sandra Block is one of those. After reading her first two books, I eagerly awaited this third installment. When one of the librarians told me that The Secret Room had been published, I had a hold put on the book. I read it in two evenings, barely being able to put it down. Like after reading the last book, I am waiting for number four in the series. Craig Bacon has a secret room. It is full of Grateful Dead CDs. He locks it so Wendy can’t throw them away.